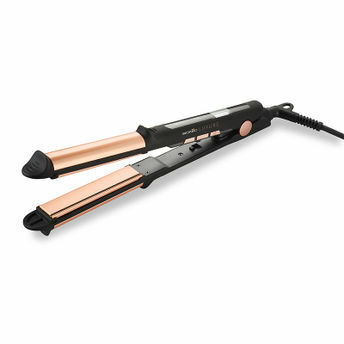 Straighten or curl your hair easily using the Ikonic 2 in 1 hair styler. This multi-purpose hair styler works as a flat iron and curling iron. Straighten or curl tresses with this revolutionary tool - the outer plate housing instantly heats up creating the perfect design to achieve silky, shiny curls and waves. It also features ceramic-coated plates and a stainless steel outside barrel for sleek hair styles effortlessly. Rubberised body for comfortable grip and control.